So now that Gil Meche has quit, does that mean the Kansas City Royals are going to win the World Series this year? Too laughable for words? How about Milwaukee, because Trevor Hoffman has hung ’em up while still theoretically still with the Brewers? If you haven’t clicked away by now, don’t think for a moment that I’m suggesting there’s a predictable correlation between any of these things, but there is a not insubstantial list of occasions in history in which a prominent player – or even star – has retired only to see his last team go on to win the World Series the following fall. Three of the game’s All-Time greats managed this impossible and dubious trick. Stan Musial was a World Champ in three of his first four seasons in the majors (’42, ’44, ’46 – he spent 1945 in the service) and then slogged it out with some pretty bad Cardinals teams for the next 17 years before retiring after the ’63 campaign. He then watched from the distant front office as the Birds won it all in ’64. The other two immortals managed to miss out together. Ty Cobb and Tris Speaker had been forced out of their player-manager jobs in Detroit and Cleveland respectively after a gambling scandal hit the American League in the late ’20s, and concluded their careers as teammates with the 1928 Philadelphia A’s. They left (Cobb to true retirement, and Speaker to a pinch hitting/managing gig with Newark of the International League), and the Athletics won the 1929 Series. Speaker had won crowns in Boston and Cleveland, but though he was in the Series in his second, third, and fourth full seasons in the majors in Detroit, the Tigers lost all three of those Classics and for everything else he did, Cobb could never claim he won a Series. The most touching example of this impeccably bad timing would obviously be Don Mattingly, who arrived just after the Yankees lost the 1981 World Series. Mattingly suffered through the worst of the Steinbrenner years at Yankee Stadium from 1982 to 1993 without once seeing the post-season. Mattingly’s ’94 Yanks, a pretty good team, were snuffed out by the strike, and in ’95, when he finally reached the playoffs after having announced his retirement, they blew a chance at what would’ve been his only Series appearance by coughing up the 2-0 lead to the Mariners. The Yankees, with Tino Martinez in Donnie Baseball’s stead at first base, went on to win the Series in 1996. Amazingly there are at least two other Yankee first basemen who did the same thing, although neither had as much to complain about as did Mattingly. George McQuinn retired after the 1948 season, just before the Yanks went on their run of five straight Championships. But McQuinn had already gotten his ring with the ’47 Yankees. McQuinn’s retirement opened up a path for Joe Collins to take over much of the work at first base in the Bronx. Collins was hardly cheated: he only played eight full seasons but was on six World’s Champs. When the Yanks decided to trade him to Philadelphia after they lost the 1957 Classic, Collins retired – and New York rebounded to win the 1958 crown. Mathematically, with all those titles, it’s not surprising that there are at least four other Yankees on this strange list. They began asking “where have you gone, Joe DiMaggio?” in the winter of 1951 when he retired. With nine rings in just thirteen years on the field, the Yankee Clipper did not get shortchanged. Nevertheless, New York won two more in his first two years away from the game. The talented Jerry Coleman, still going strong in the Padres’ booth just 53 years later, quit the Yanks after the ’57 loss to Milwaukee and, like Collins, missed the ’58 crown. His fellow Yankee infield stalwart Gil McDougald retired after the ’60 loss to Pittsburgh and thus missed the ’61 win over Cincinnati and the ’62 victory over San Francisco. And of the most recent vintage, Mike Mussina’s triumphant climax to his great career, his first 20-win season in his swan song of 2008, also meant he missed out on what would’ve been his only ring in 2009. This list is probably incomplete; I confess to having done it off the top of my head. But Pee Wee Reese is on it, retiring from the 1958 Dodgers and so on their ’59 Series winners only as a coach. If you want a manager, take Earl Weaver. He retired from the Orioles after 1982. They won it under Joe Altobelli in 1983. Making things worse, the Birds soured on Altobelli in ’85 and Weaver un-retired for two unhappy seasons. There are a couple of judgement calls, too. Tim McCarver called it quits from the Phillies at the end of 1979 and went into the broadcasting booth, only to be activated in September, 1980 when rosters expanded. But he was back in civvies for the World Series triumph, which would’ve been his first since St. Louis in 1964. There is also the iffy case of Harvey Haddix. The Baltimore Orioles traded the veteran pitcher to Milwaukee in August of 1965, but Haddix told the Braves he was intending to retire in a month and they shouldn’t waste money or players on obtaining him. In fact, his last major league game was on August 28, 1965, so I’ll leave it to you as to whether or not he qualifies on the bad timing roster considering the ’66 edition of the Orioles won the Series. Lastly, the most frustrating case I can recall would have to be that of Mel Harder, the Cleveland Indians pitcher for whose Hall of Fame candidacy Ted Williams never stopped lobbying. Harder joined the Tribe in 1928, eight years after they’d taken the Series under player-manager Speaker. He won a tidy 223 games before finally giving up after his 20th season in Cleveland, in 1947. The Indians promptly won the 1948 World Series, in no small measure because of their rookie pitching coach – Harder himself. He stayed in that job through 1963 (and obviously the Indians never won the Series after his first year). To expand our terms a little bit, when the Indians let him go, Harder quickly hooked on as pitching coach of the Mets (five years before their Championship). He would move on to the Reds in ’66 and stay through 1968, exiting just before The Big Red Machine rose to prominence. So if the Royals or Brewers surprise everybody this year, maybe you know why. Two books to address today, one brand new, one kinda. Two caveats: the publisher is putting out my next book, and this really isn’t a review, because by now if you’re a baseball fan and you don’t know what BP is, you’re working in a mine without one of those helmets with the lights on it. This is more about the headlines from the annual phone-book-sized tub of prophecies these figure filberts put out, than it is any kind of assessment of the publication as a hole, because we don’t really know how good each year’s edition is until after the season is over. But for once, there shouldn’t be much argument about what is the Statistical Reduction crowd’s biggest forecast for the season ahead: The collapse of Derek Jeter. OK, “collapse” is a little strong. The actuarial tables of the game again prompt the editors to call Jeter’s team “still the class of MLB,” but they pummel the Captain personally. He finished 2009 at 18-66-.334-.406-.465 with 107 runs and 30 steals. BP sees 2010 as 11-58-.286-.359-.401 with 67 runs and 10 steals. As I understand the formulas with which the BP numbers are calculated, there is room for a dollop of common sense and/or extenuating circumstances. But mostly the stats-to-come are generated, in Jeter’s case, by comparing him to what happened to every 14-year veteran going into his 15th season, and what happened to every 35-year-old shortstop as he turned 36, and employing every other demographic comparison in baseball history. And the loss of 48 points of batting average and 40 runs and 64 points of slugging percentage, is the evident result. It actually gets worse. The one BP number that gives you the best overall sense of a player’s total worth to his team is VORP (Value Over Replacement Player). In short, it measures in net runs (how many more do you score, how many fewer does the other team score) what were to happen if the player in question was suddenly reduced by the average bench guy. Last year, Derek Jeter’s VORP was 71.2 (Albert Pujols’ was 100.1), meaning if he had quit on Opening Day 2009 to be replaced full-time by Ramiro Pena, the number of fewer runs the Yankees would’ve scored, plus the number of more runs they would have allowed, would’ve been 71. Jeter’s predicted 2010 VORP is just 20 – a loss of 51.2 when nobody else in the majors is predicted to lose more than 37.2 (and that’s Joe Mauer, by the way. The BP folks readily admit that their formulae tend to punish spectacular seasons). Merging the topics of catching and the Yankees, BP sees Jorge Posada dropping from 22-81-.285-.522 to 12-49-.263-.445 (and losing 21 VORP points in the process). If BP is right, there are similar harrowing declines ahead for Ryan Howard (to hit .249 this year), and Michael Young (.297), and Kevin Youkilis (22-86-.283), and David Aardsma (15 saves). On the other hand, it sees Nick Johnson emerging to lead the AL in On Base Pecentage, Kelly Johnson to rebound in Arizona, Jeremy Hermida to blossom in Boston, and Geovany Soto to comeback in Chicago. Certainly two of the stranger computer-generated forecasts: Chris Davis with 33 homers, and your 2010 Major League Saves leader: Joakim Soria with 43 in Kansas City. More than 30 years ago I made an enemy for life of a baseball writer named Maury Allen. I panned his biography of Casey Stengel because I felt he had forfeited the credibility of the book’s essence – exclusive, heretofore unpublished anecdotes and quotes – because he had made so many simple historical mistakes. Allen had the Polo Grounds in which Stengel played and managed off-and-on for 50 years overlooking the Hudson River, when it in fact overlooked the Harlem River, a no-brainer mistake that nobody who had lived in New York for more than three weeks would make. My point was not that it was fatal to make a few dozen such flubs, but that if I as the presumably less-expert reader could spot such obvious mistakes, how many more of them were in there that I wasn’t smart enough to catch? And why would I trust the accuracy of the quotes and the stories as offered by a writer who couldn’t keep his basic geography straight? If you could switch the Hudson for the Harlem, you could – I don’t know – switch Hugh Casey for Casey Stengel. Sadly, this dynamic is reproduced in Vaccaro’s book about the epic eight-game World Series of 1912 between the Giants and Red Sox. 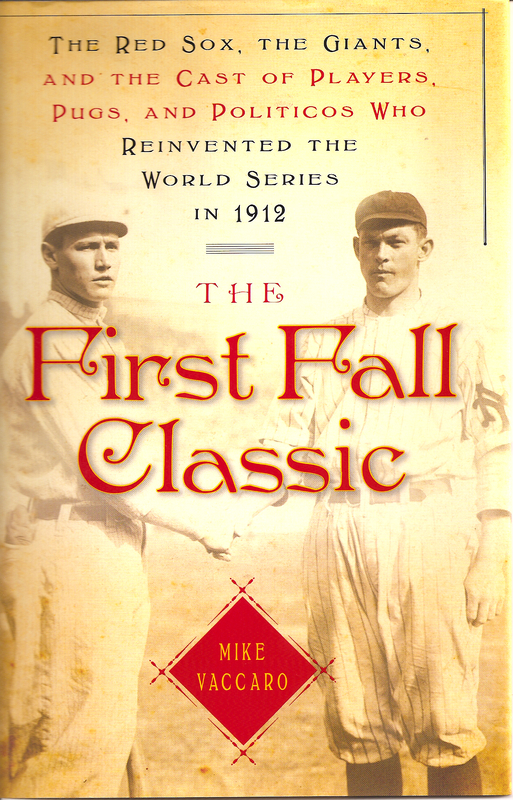 The Series – and the topic – had everything: a dubious tie game, the first year of Fenway Park, Christy Mathewson, John McGraw, President John F. Kennedy’s grandfather, and the year Smoky Joe Wood won 37 of the 120 games (regular season and World Series) he would win in his lifetime. For an obsessive historian with a gift for composition, like my friend Josh Prager of The Echoing Green fame, the 1912 Series would basically sing itself and he would write down the notes as quickly as he could. I truly hoped this book would be like this (I went out and bought it retail – the ultimate sign of respect by somebody in the same business) and given the volume of startling stories and the in-the-clubhouse quotes from men dead half a century and more, Mike Vaccaro certainly seems to have tried to make it like that. shows that the second deck ends thirty or forty feet to the left of the foul pole, and the seats in fair territory are the bleachers. 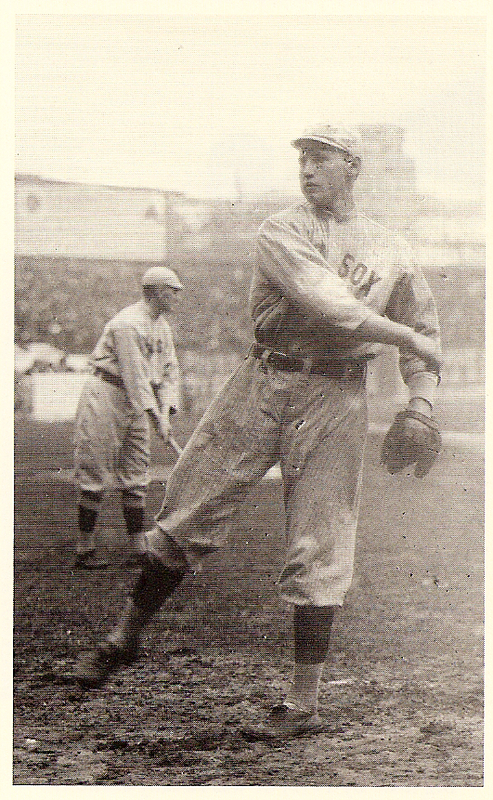 There are, in fact, actually at least two photos showing Joe Wood, with the Red Sox in the Polo Grounds, which show, in the background behind him, either the left field foul line leading directly to the bleachers, not a double deck, or, the left field foul pole standing like a lone tree with no “extended” deck even close to it. One of him, warming up, is included in Vaccaro’s book, right after page 146.
his glove, is the left field foul line. The other photograph – the background largely washed out but with the undecked left field corner still vaguely visible – shows him shaking hands with the Giants’ Jeff Tesreau, and it was chosen for publication on the cover of Vaccaro’s book, below. Of the remaining twenty or so that I caught, most have clearer connections to the sport itself. Hall of Famer Eppa Rixey becomes Rixley, 1912 Red Sox infielder Steve Yerkes becomes Sam, Redland Field in Cincinnati becomes “brand-new Crosley Field” (it wasn’t renamed Crosley Field until 1934 and the radio baron who did it was still a 20-something developing automobiles in Muncie, Indiana, when Redland Field was brand-new in 1912). There is a lot of historical tone-deafness – particularly distressing considering Mr. Vaccaro often covers the Yankees. He recounts a conversation among McGraw and New York sportswriters about the Giants taking in the American League New York Highlanders as tenants at the Polo Grounds for the 1913 season. Vaccaro quotes the famed Damon Runyon telling McGraw that his paper’s headline writers have a new name intended for the team: The Yankees. McGraw is quoted as wondering if it will catch on in 1913. 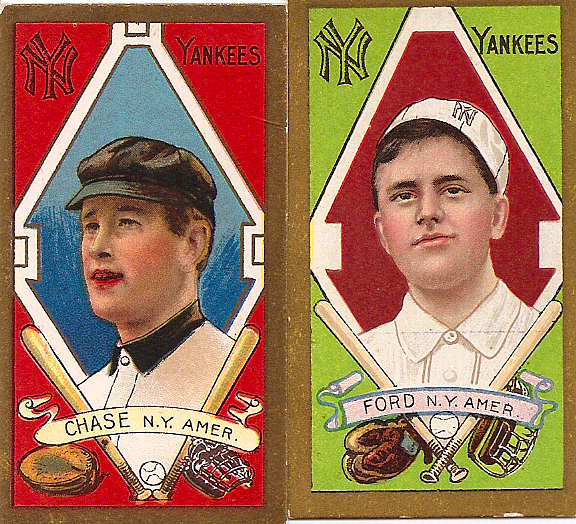 Even if the mistake originates elsewhere, it should’ve rung untrue to Vaccaro: The name “Yankees” had been used on the baseball cards as early as 1911, and on a team picture issued by one of the New York papers in 1907. If McGraw and Runyon hadn’t heard the name “Yankees” by the time of the 1912 World Series, they’d both had undiagnosed hearing problems for five years. Vaccaro also has a lot of trouble with geography. He indicates that Giants’ owner John Brush had a mansion in “upstate Pelham Manor” even though the town is essentially parallel to 241st Street in Northern Manhattan. He mocks the nickname “Swede” for Danish-born Boston outfielder Olaf Henriksen as an indication that baseball didn’t worry about geography in assigning monickers. But until 1905 Denmark was part of a union with Norway, and as late as the early 1800’s, those two countries were trying to reestablish a medieval tripartite union with Sweden. For all we know, Henriksen might have considered himself Swedish. Evans? The catch was by Josh Devore. Evans – Billy Evans – was the umpire who confirmed the out. Later, there is the inexplicable observation that during the tense eighth game, so much of Manhattan was at the then-popular newspaper scoreboards that “Schoolrooms were scarce.” While this was doubtless as true in the New York of 1912 as it is in the city of 2010, it wouldn’t seem to have anything to do with baseball. Students in schoolrooms, yes. The rooms themselves? In fact, Speaker would become a part owner not of the league, but of one of the teams in the league, the Kansas City Blues. You know where else this mistake turns up? In 1929 Speaker replaced Walter Johnson as the manager of the Newark Bears of the International League, a post he held for two years. He became a part owner of the American Association. The announcement of Speaker’s election to the Baseball Hall of Fame was made in January, 1937. Yep. Tris Speaker’s Wikipedia page.